As expected in our last weekly analysis, the euro moved towards the downside in what looks like a clear 5-wave impulse, confirming our view that the trend has changed and is heading south for several more weeks. The bigger picture sees that the euro is still moving towards the downside in primary wave C, which is forming an impulse labeled intermediate waves (1) through (5). Intermediate wave (4) formed a double combination labeled minor waves W, X and Y. Within it, minor wave Y formed a zigzag labeled minute waves a, b and c.
Within it, minute wave b formed a running flat labeled minuette waves (a), (b) and (c), retracing almost 38.2% of minute wave a. Minute wave c reached twice the length of minute wave a, and touched the upper trend line of the channel drawn around minor waves W, X and Y. This count expects the euro to be moving towards the downside in intermediate wave (5), which is most likely forming an impulse labeled minor waves 1 through 5, to complete primary wave C of cycle wave x. This will be confirmed by movement below 1.1017. At 1.0462 intermediate wave (5) would reach the end of intermediate wave (3), then at 1.0220 it would reach 61.8% the length of intermediate wave (3). But before the downtrend is in full force, price should move towards the upside in minor wave 2. At 1.1371 minor wave 2 would retrace 38.2% of minor wave 1, then at 1.1503 it would retrace 61.8% of its length. In our previous analysis “GBPUSD: The New Kid in Uptrend Town!”. Cable was expected to continue moving upwards to complete a second wave before reversing directions in an impulsive manner within a third wave. Cable unfolded exactly as expected and targets were reached and exceeded by 22 pips before reversing directions sharply towards the downside. We are updating the main count`s according to the latest price action with short term targets, invalidation and confirmation points. The alternate count expects that Cable has more to offer towards the downside to complete a fifth wave before entering a short consolidation phase. As always we will wait for either count`s confirmation point to be reached to determine the highly probable count. Elliott Wave chart analysis for the GBPUSD for 28th August, 2015. Please click on the charts below to enlarge. This count expects that wave C blue and therefore intermediate wave (2) black might be complete and that intermediate wave (3) black has started unfolding towards the downside. Wave i pink unfolded as an impulse labeled waves (i) through (v) green. Wave (w) green unfolded as a zigzag labeled waves a, b and c orange. Wave a orange unfolded as an impulse labeled waves 1 through 5 purple. Wave b orange unfolded as a zigzag labeled waves A, B and C purple. Wave (x) green unfolded as a zigzag labeled waves a, b and c orange. Wave a orange unfolded as a leading diagonal labeled waves 1 through 5 purple. This count expects that wave iii pink is at its early stages with wave (i) green complete as an impulse labeled waves i through v orange and wave (ii) green is unfolding as an expanded flat correction towards the upside. Within wave (ii) green, waves a and b orange are complete and wave c orange is underway. 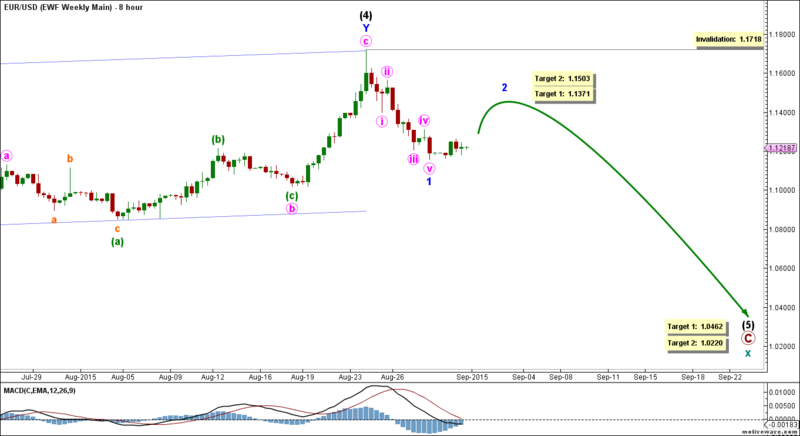 This count would be confirmed by movement above 1.5445. We have a target zone that starts at 1.5455 as at that level wave c orange will reach 1.618 of wave a orange and that target zone ends at 1.5476 as at that level wave (ii) green will reach 0.236 of wave (i) green. Finally if exceeded then the next logical target is at 1.5528 as at that level wave c orange will reach 2.618 of wave a orange. This count would be invalidated by movement above 1.5820 as wave (ii) green may not retrace more than 100 % of wave (i) green. As well, this count would be invalidated by movement below 1.5335 as within wave c orange no second wave may retrace more than 100 % of its first wave. The only difference between both main and alternate counts is within the subdivisions of wave v orange. This count expects that wave v orange is incomplete and that it is unfolding downwards as an ending diagonal labeled waves 1 through 5 purple with waves 1 and 2 purple complete and wave 3 purple is underway. This count would be confirmed by movement below 1.5335. Since wave v orange exceeded equality with wave i orange by 1 pip, the next logical target is at at 1.5321 as at that level wave v orange would reach 1.382 of wave i orange and the second target is at 1.5290 as at that level wave v orange would reach 1.618 of wave i orange. This count would be invalidated by movement above 1.5510 as wave 2 purple may not retrace more than 100 % of wave 1 purple.